Byzantium and the Early Islamic Conquests by Walter Emil Kaegi Jr.
We’d love your help. Let us know what’s wrong with this preview of Byzantium and the Early Islamic Conquests by Walter Emil Kaegi Jr.. Preview — Byzantium and the Early Islamic Conquests by Walter Emil Kaegi Jr. The Byzantine empire lost many of its most valuable provinces to Islamic conquerors in the seventh century, including Syria, Palestine, Mesopotamia and Armenia. This study investigates the eve of the conquests, as well as how the Byzantine government eventually came to rationalize its disasters. To ask other readers questions about Byzantium and the Early Islamic Conquests, please sign up. A five-star effort, with a mixed, three-star reaction. Always a fascinating subject, the nature of the early Islamic irruption out of the Arabian peninsula is dogged by all sorts of baggage, ideological backsward-projecting or what-have-you, not limited to any particular side of the argument. Kaegi tries to transcend this by focusing largely on the military aspects, especially Byzantine wan-ness after the wars against the Sassanids. Kaegi does the best he can with the extant materials, and gives g A five-star effort, with a mixed, three-star reaction. Kaegi tries to transcend this by focusing largely on the military aspects, especially Byzantine wan-ness after the wars against the Sassanids. Kaegi does the best he can with the extant materials, and gives good discussions on the veracity of sources on both sides. Certainly that the Islamic armies on the march won is not contested, but the why, which could be interesting, is largely relegated to strategic matters here. Issues of faith and Christian/Jewish minority disdain for the Byzantines, sure a factor, is barely entered into here, a startling gap that would've made the picture whole, whether an actual factor or not. Walter Kaegi's 'Byzantium and the Early Islamic Conquests' is essential reading for anyone who wants to understand the details behind the rapid Byzantine collapse in Syria and Mesopotamia. However, those who want a more general and broader historical survey of the period in general should look elsewhere, as this book's focus is narrow and its audience primarily scholarly. 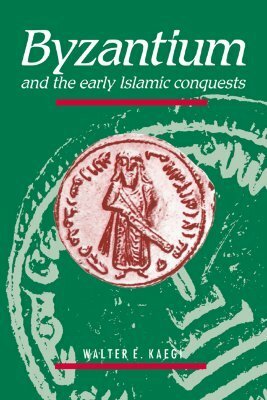 For example, the Muslim conquest of Egypt is only ever mentioned in passing: the book's focus is purely that of Syria, Armeni Walter Kaegi's 'Byzantium and the Early Islamic Conquests' is essential reading for anyone who wants to understand the details behind the rapid Byzantine collapse in Syria and Mesopotamia. However, those who want a more general and broader historical survey of the period in general should look elsewhere, as this book's focus is narrow and its audience primarily scholarly. For example, the Muslim conquest of Egypt is only ever mentioned in passing: the book's focus is purely that of Syria, Armenia, and Mesopotamia. Kaegi wisely takes a more military approach to the problem than traditional scholarship has applied, and he manages to argue quite convincingly that the religious dissent between Nestorian and Monophysite churches in the east and Constantinople, the theory that is still lazily applied, played virtually no role in the Muslim success. Instead, he cites the strategic difficulty in defending Syria, the surprise and shock of the Byzantines that led to a defeatist attitude, the lack of weapons amongst the Roman population in Syria, and the complicated politics of the last Romano-Persian war. This book focuses on a chronologically tiny amount of time by the standards of ancient and medieval history. As only a few years are discussed, Kaegi is able to go into great detail and thus is able to argue his thesis convincingly for all of the geographic regions he surveys. Kaegi also needs to be commended for his use of Armenian and Arabic source material. He begins the book by noting the limitation of the Greek and Latin sources (although he does not ignore the difficulties in using Arabic, Syriac, and Armenian material and some of the requisite historiographical problems) and he wisely does not assume that the Byzantine sources are in anyway better than the others. Theophanes is accorded the rather low place he deserves. The Battle of Yarmouk also receives a lengthy and solid treatment, far better than David Nicolle's Osprey book, although the description in Haldon's The Byzantine Wars is still probably the best narrative of the battle. About Walter Emil Kaegi Jr.
Books by Walter Emil Kaegi Jr.